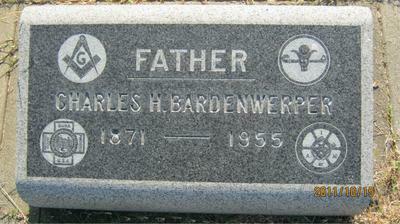 Above is a photo of my great-grandfather Charles H. Bardenwerper's headstone. I can identify three of the symbols. However, the Ram (? ), the Sun and the Crook elude me. Do you have an idea of what that one is? Judging from the symbols on the headstone, it appears to me that your great-grandfather was a member of the Independent Order of Odd Fellows, whose symbols include the ram, sun and crook...all of which have biblical meanings. Since his headstone also displays Freemasonry's square and compasses symbol, it appears that he was also a Freemason.